EazyDraw App Store Version 9.4.0 with Mojave light and dark support. EazyDraw a vector drawing application: For the full journey from Jaguar to macOS Mojave EazyDraw has been the trail blazing App for the new vector drawing paradigm on macOS. EazyDraw marries the latest mac technology with the simple elegance of the original Mac drawing applications. EazyDraw provides a balanced feature set that includes tools needed for technical drawing, web and App graphic design, print publishing, logos, page - text layout and more. Easy enough for everyone but with the depth your project will need. Includes comprehensive support for bitmap and vector graphic formats: Import and ungroup for edit PDF, and EPS. Import and export SVG and now DXF. Preview and publish to EPS and TIFF with RGB or CMYK process colors. Exchange scaled CAD drawings using DXF. Publish web graphics. Create Mac, iPhone and iPad App development graphics and icons. So jump right with this Get version at the App Store, the free Basic mode is adequate for small projects. Fully enable with a one month non renewable subscription. Make EazyDraw your primary communications App with an in-app one year subscription (non-auto-renew) or in-app purchase EazyDraw version 9. The EazyDraw App Store version 9.4.0 runs on macOS, Mojave and High Sierra and implements latest macOS technology: Dark Mode, iCloud, Retina graphics, Resume, Versions, Full Screen and others. Stay focused and productive under both light and dark ambient conditions. Change between light and dark modes on the fly, no need to quit and restart EazyDraw. Choose light or dark mode on System Settings, General Tab. The EazyDraw user interface employs fully dynamic semantic driven system colors and icons, including accent color, light and dark mode, and accessibility contrast. 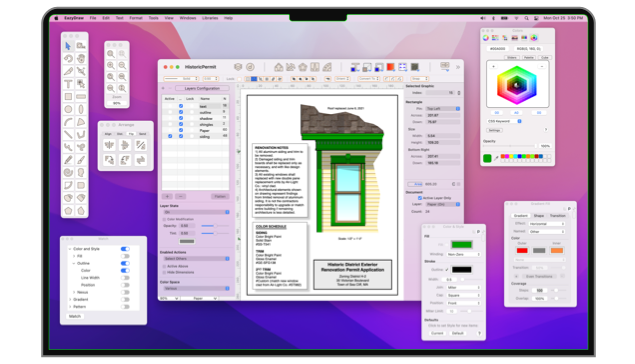 Naturally all the graphics for EazyDraw's dynamic Mojave-esque user interface were drawn and published to the Xcode asset catalogues using EazyDraw. MacBookPro and iMac models starting with late 2015 are using the new P3 color gamut displays. P3, like Adobe RGB is a wide-gamut alternative to sRGB. The DCI-P3 wide color gamut standard matches the capabilities of newest movie theater digital projection technology. Mojave has implemented a new Color Space called Display P3 which adapts the movie projector color gamut to computer display technology. Display P3 is rapidly expanding to iPad, iPhones and Microsoft Surface. EazyDraw 9 is fully color managed to author web graphics for these high dynamic range colors. For professional (or semi-pro) use, EazyDraw 9 provides fully color managed image authoring. This includes live visualization and tagged image export (PNG, JPG, TIFF, PDF, SVG). If your audience includes mobile, then P3 images are a must. EazyDraw provides full support for SVG (Scalable Vector Graphics). SVG is an XML language for the description of 2d vector graphics. This is an open standard sponsored by the World Wide Web Consortium (W3C). SVG has wide corporate and platform support, most browsers now support SVG. EazyDraw is a vector based drawing application for desk top publishing (DTP) with Apple's Macintosh OS X (Mac OS-X) operating system. It is an illustration or drawing software application that offers vector-based graphics editing and creation capabilities for creating simple not-photographic drawings, technical diagrams and illustrations such as logos, icons, buttons and stylized art. There are several specialized drawing applications available for the graphic arts, or architectural professional. We all know how much these cost and how hard they are to master. EazyDraw is drawing for the rest of us who want to have fun exploring our creative potential. EazyDraw is very configurable, customize drawing elements like arrows, gradients and dash patterns. Improve productivity with user configurable shortcut keys. Create your own drawing tools and custom tool palettes with User Libraries and their powerful "Tool" mode. EazyDraw is a new design tool for use on the macOS platform. Its uses range from simple technical drawings, flow charts, business communications, commercial line art illustrations to graphic elements for application software and web design elements. Educators are also finding EazyDraw to be perfect for introducing new user to computer drawing. Take advantage of the App Store price and the convenience and security of ordering through iTunes. Use the Back button the browser to return to the Mac App Store and place your order.